Pondicherry – french spellings on sign boards listing roads; wide and perpendicular boulevards, colonial style mansions and gorgeous hues of bougainvillea bushes. First day in Pondy and as we were heading out of the house, I glimpsed a tree with these beautiful powder puff like blooms and immediately wanted to photograph them. Since they were right outisde the house, we decided to carry on and shoot later in the day. Imagine my despair, when I came to shoot in the evening – the flowers had all wilted away. Most were strewn on the road below and were crushed/trampled upon ruthlessly. I picked up two whole blooms and carried them home; only to have my cousin Shekho look at me in horror. He despised the smell emitted by these flowers; while I couldnt smell any fragrance from them. Undeterred, I pulled out old newspapers and burried them under; shekho asked me to kindly remove them from his room!!!! He warned me that my room will smell too if I keep them there – three days now and no bad smell. My bua also told me she hated the smell and I will be sorry for keeping them – still wondering what are they going on about? Infact Bua is very unhappy with these trees since the roots get into the drains and clog her bathroom water outflow. Plus she hates the smell and mess; not to mention the nuisance value as hordes of people try to break these blooms to take home or sell to the foreigners/ tourists. The lady (70 yrs old French national) gave me her email id and requested me to mail some of my pics to her as she too was fascinated by the blooms. I asked her if she knew what these were called; but she couldnt recall. Some 3o shots later, I packed up and headed onwards for some coffee and croissant. While roaming around, I walked into SABDA – a bookstore where publications are mostly about/by Sri Aurobindo and the mother Mira of Auroville fame. 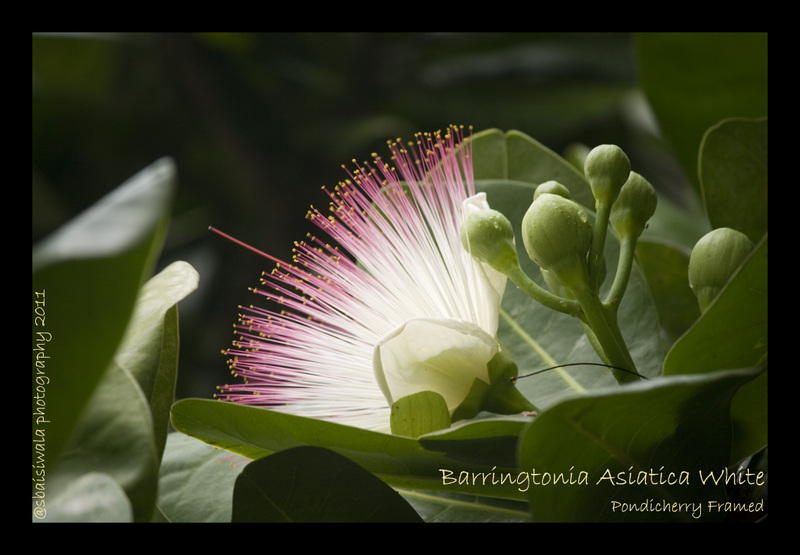 There I saw some book covers and postcards with these blooms on them – immediately turned over and voila got the name – Barringtonia Asiatica White. Infact the mother has named it something else in her words – cannot recall now what it was. Armed with the pics and name; hunted google and landed at wikipedia to know that every part of this tree is poisonous – ouch!! explains the bad odour Bua and Shekho could smell from it. This tree is also called fish poison tree or sea poison tree or box fruit tree as its fruit it very box like. These are basically mangrove trees; thus explains why the roots spread outwards more than downwards. Poor Bua! The flowers wilt by mid afternoon as they have a very short life. 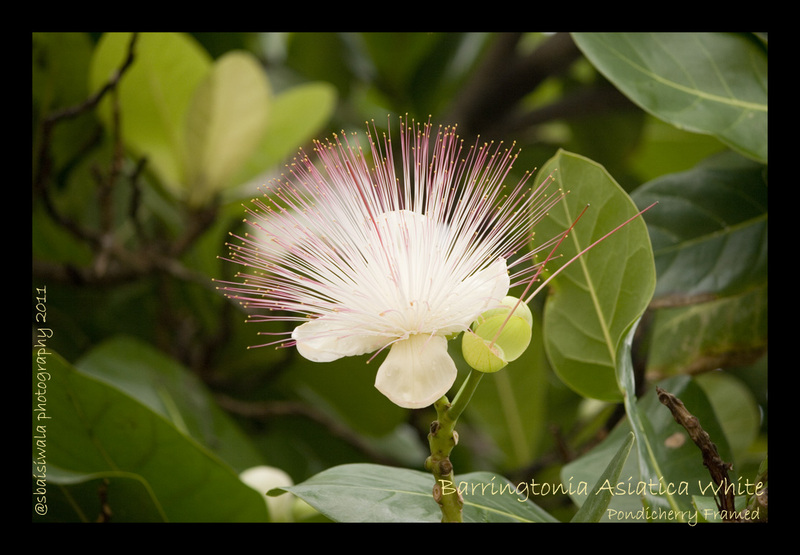 These trees are native to Phillipines, Malyasia, etc ; mostly on the islands along the Indian Ocean and Western Pacific Ocean. 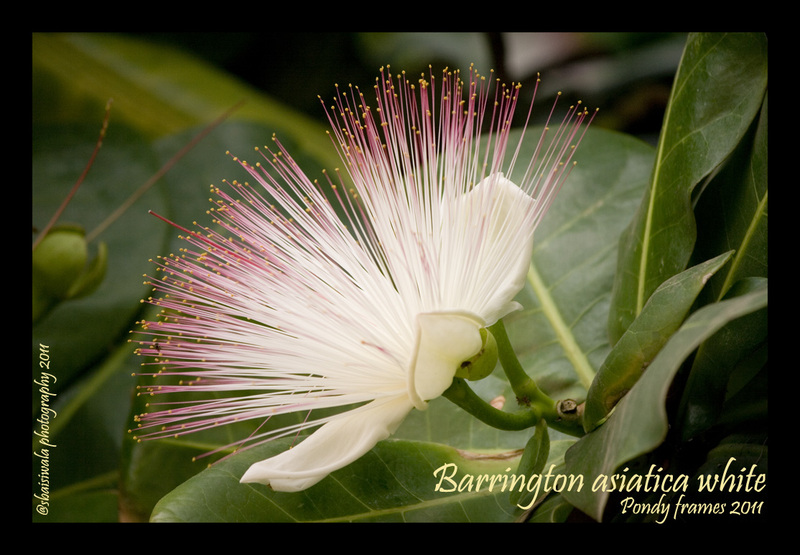 These have been planted in some sea side town of India as ornamental trees. And ofcourse these are used to make posion for stunning fish!!!! I plan on clicking some more pics of these before I leave Pondy. thanks Santa – thats so nice to hear. I will upload soon!! Yes Zubie baby – you are absolutely right! !